As I mentioned in yesterday’s column, in Mexico today is El Dia de los Muertos (the Day of the Dead), a festival honoring the departed. And though it takes place on the Catholic observance of All Saints Day (continuing into tomorrow, All Souls Day), it is a far more important and popular holiday in Mexico than in other Catholic countries because it is in reality a descendant of the Aztec festival of the goddess Mictecacihuatl. As we’ve discussed a number of times before, nearly every Christian holiday is an older pagan observance reconsecrated to the newer religion, and many pagan gods are still revered as holiday figures (such as Santa Claus or Befana) or Christian saints (such as St. Brigit). But in the Americas, Christianity never completely replaced the native religions as totally as it had in Europe, and many peasant religious practices in Latin America are fusions of Catholic teachings and pagan beliefs in much the same way as Voodoo and Santeria are combinations of Catholicism with African and Caribbean beliefs. For example, Our Lady of Guadalupe is a syncretism of the Blessed Mother with the Aztec mother-goddess Tonantzin (“Guadalupe” is a Hispanicized pronunciation of one of her titles, Coatlaxopeuh); it is even possible that her cult was an artificial one designed by Catholic clergy as an aid in converting the natives. But while the Church was happy to allow the festivities of Mictecacihuatl to be transferred to All Saints Day, it had no use for the death-goddess herself; her worship therefore went underground and did not reappear in public for centuries. Her modern name is Santa Muerte (“Saint Death”) and today is her feast day. Since Christian theology has no place for apotheosized Death, the Church could not convert Mictecacihuatl into an official saint or folk figure; like so many pagan goddesses she was therefore condemned as a devil and her worshippers persecuted as witches or Satanists. But the Aztecs had a strong reverence for death that could not be ground out of them by the conquerors’ religion; most Mexicans were satisfied with the elaborate Day of the Dead festivities, but others continued to venerate La Señora de las Sombras (The Lady of the Shadows) in secret. Researchers have discovered relics from hidden temples and references to suppressed rites dating back to the early 18th century, and the cult began to emerge into public view during the political unrest of the late 19th century. The cartoonist José Guadalupe Posada created a secularized representation of her called La Calavera Catrina (The Elegant Skull) which has become popular in association with the Day of the Dead, but worship of the goddess was still harshly suppressed by the Church until the 1940s, when it began to appear in poor neighborhoods of Mexico City. By 1965 many of her devotees started openly declaring themselves, and by the 1990s they numbered about two million. The first public shrine to Santa Muerte was established in Tepito in 2003, and since then others have sprung up all over Northern Mexico and in Mexican communities in the United States; a full-sized church to her is supposed to be built in Mexico City. Santa Muerte appears as a skeleton in a robe or dress, usually white but sometimes other colors depending upon what the devotee wishes to invoke her for. She usually carries a scythe and a globe, or sometimes an hourglass. Her rites are borrowed from Catholicism and include praying the rosary; sometimes her images are placed alongside those of Jesus, Our Lady of Guadalupe, or even Jesús Malverde, a Robin Hood-like folk hero revered by many Mexicans as a saint. Candles maybe burned as prayers to her, and believers also offer her small gifts of fruit, flowers, cigarettes, coins, etc. Santa Muerte is particularly revered among the very poor and those whose lives are more dangerous than those of others, especially those who work at night or feel unwelcome in traditional churches because they live outside the law. She is extremely popular among prostitutes, taxi drivers, bartenders, policemen and soldiers, but also among petty thieves, drug traffickers, smugglers and prisoners. 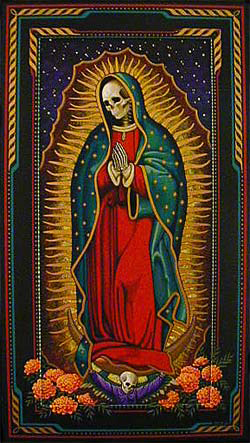 Though criminals are the minority of her worshippers, the Mexican government has sometimes used the association (and the Church’s condemnation) as an excuse to persecute the sect and to consider the presence of a Santa Muerte shrine or altar as “evidence” of criminal behavior, just as the Pima County, Arizona Sheriff’s Office tried to claim that a picture of Jesús Malverde was “evidence” that José Guerena (who was murdered by the Pima Country SWAT team last May 5th) was connected to a “narcotics ring” on the grounds that Malverde is revered by drug traffickers (and also immigrants and those who have been robbed, but obviously that’s not important). I don’t ever recall reading that the Catholic Church was reviled during Prohibition because most Mafia members were Catholic (many Americans were anti-Catholic due to their protestant upbringing but that isn’t the same thing). But as traditional religion has decreased in importance to many people, governments have become increasingly emboldened to persecute people on religious grounds. This has nothing to do with the government itself or its members being less religious; states with official religions are perfectly happy to oppress members of minority religions as well. But for those regimes, the official religion serves the purpose of social control, just as the state-sanctioned religions called “political parties”, “feminism”, “socialism”, etc do today. It is only minority religions which oppose the status quo or encourage private, personal behavior of which the state disapproves that are targeted for suppression nowadays, and if a few members of the religion are violent outlaws, it provides a convenient excuse for persecution of the entire group. Those who revere Santa Muerte have not been singled out for vigorous suppression yet, but given her popularity among those who live outside of middle-class society in both Mexico and the U.S., it’s only a matter of time. “Amsterdam” is a short history of prostitution in the famously-tolerant city.